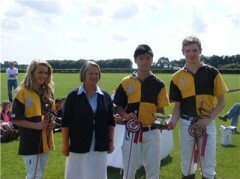 Garvy Beh and his team from Wellington College won the Under 16 UK National Championship held on June 14, 2009 at Longdole Polo Club. In the early morning of 22nd June, we received a very special greeting from someone whom well known in Argentine Polo, Luisa Miguens himself for thanking us to supporting his dream. With such a warm hearted feeling, we’ve decided to share this greeting with everyone here in celebrating 100 years of Argentine Polo.